Odds seem to be stacked against S'poreans when it comes to employment. Leong Sze Hian. We apologise for not updating this website the last couple of days. TOC is taking a few days’ break. We’ll be back soon. Leong Sze Hian was invited by BlogTV to pen an article for them. We publish it below. Before we talk about whether Singaporeans deserve to have more privileges than PRs and foreigners, perhaps we could first ask whether there may be any areas whereby foreigners or PRs have “more privileges” than Singaporeans? Employers which employ foreigners, do not have to contribute CPF. So, the employer saves up to 14.5 per cent of the salary. Employ a female on the S-Pass or work permit, you don’t have to worry about the four months maternity leave if you employ a Singaporean lady. As I understand it, the conditions of the S-Pass and work permit forbids them from becoming pregnant. If you employ a Singaporean male, he has up to 40 days of reservist liability in a year. In contrast, employing a foreign or PR male, eliminates this problem. Since those on say work permits are stuck with the same employer for up to three years, the employer may not have a turnover problem – Singaporean employees can resign anytime. So, is the playing field level in employment, for Singaporeans, vis-à-vis foreigners? In this regard, I think Singaporeans may not even be asking for “more privileges”, but just a more level playing field. Moreover, since foreigners do not have to make their own employee’s CPF contribution of up to 20 per cent, their disposable income may be more than a Singaporean worker. 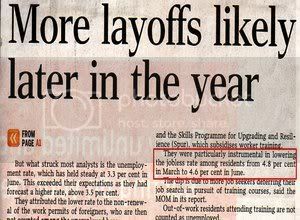 This may be one of the reasons why the wages of lower-income, lower-skilled jobs may have been declining over the years. For example, cleaners that used to earn about $800 a month a few years ago, now only earn about $650. As Singaporeans typically have families to feed, mortgages to service, relative to foreigners or PRs who may generally be here alone, Singaporeans may find it more difficult to accept lower paying jobs, for the simple fact that it may not be enough for their basic needs relative to foreigners and PRs. The manpower regulations require employers to insure all foreign workers for at least $5,000 of medical insurance cover. However, there is no such requirement for Singaporean workers. So, in some companies, we have the abnormality of foreign workers being insured, whereas Singaporeans are not. This is another example of “less privileges” rather than “more privileges”. PR siblings (below age 35) qualify to buy resale HDB flats. However, Singaporean PR siblings (below age 35) do not. Why is it that in this aspect, even PRs may have “more privileges” than Singaporeans? I think what may really irk Singaporeans, may not be so much about how much more or less privileges there are, but rather how many Singaporeans these “privileges” policies may be affecting. In order to answer this question, we need for example, the break-down of the unemployment statistics into Singaporeans and PRs, instead of lumping them together as residents; HDB flats purchased by PRs relative to citizens, etc. PRs who have no jobs may be able to more easily return to their home country, sell their HDB flats, etc, but Singaporeans generally have no choice but to find work and stay in Singapore. We may also need to be more discerning in examining the statistics when we ask for more privileges, as sometimes, when say PRs and foreigners have to pay more for medical fees relative to Singaporeans, it may be Singaporean employers, Singaporean households, who may be bearing the brunt of the fees increase, as they are the ones paying for their foreign/PR employees, domestic maids, non-Singaporean spouses and relatives. For example, when fees increase for foreigners and PRs, but remain the same for Singaporeans, it may not be “more privileges”. Instead, it may be a greater financial burden for some Singaporeans, unless increase in fees for foreigners and PRs, means lower fees for Singaporeans. An alumnus of Harvard University, Leong Sze Hian has authored 4 books, been quoted over 1000 times in the media , host of a radio show on money matters and a daily newspaper column, has been a Wharton Fellow and invited to speak more than 100 times in more than 20 countries on 5 continents. He has served as Honorary Consul of Jamaica, Chairman of the Institute of Administrative Management, and founding advisor to the Financial Planning Associations of Indonesia and Brunei.